There seems to be bad news everywhere you look these days. Sometimes it seems like the world is falling apart. Between Ebola, climate change, Russia’s invasion of the Ukraine, and the ongoing war in Iraq and Syria. So, is this really be the best time to be born? Absolutely, by many measures — whether you are born in the US or the rest of the world. Despite the fact that plenty of problems exist, people are healthier now than ever, the world has become significantly less violent, and education is more available now than it ever has been. Here are 23 charts that show why this is the best time to be born. 1. 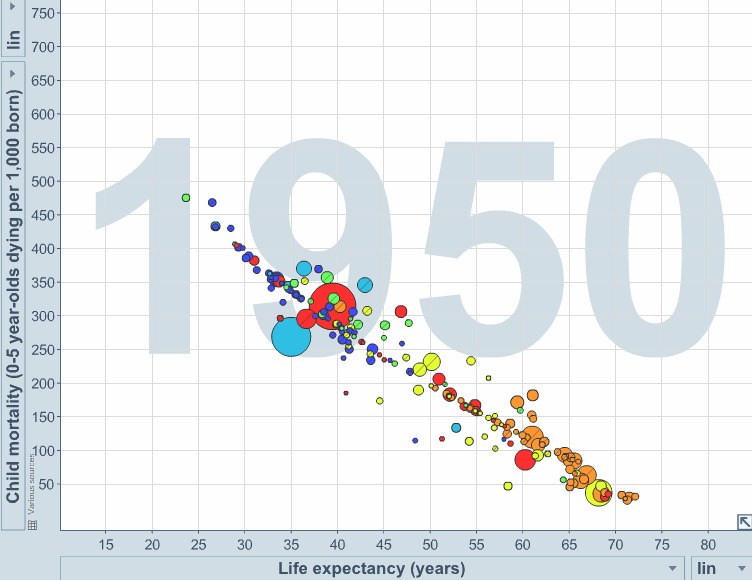 Child mortality has dropped and life expectancy has grown around the world since 1950. 2. Racial disparities still exist, but infant mortality has dropped by a huge amount in the US since 1935. 3. It’s not just the US either. Around the world, people’s risk of dying young has dropped from 14% in 1970 to 5% in 2010. Chances of dying before turning 50 were 28% in 1970, but half that now. 4. Here’s another chart that helps get that point across, showing the number of children who die before age 5 from 1960 to today. Bill Gates uses this chart to help demonstrate the ways that vaccines have transformed our world. 5. Vaccines have massively reduced the likelihood of dying or being disabled by many diseases. This chart shows the change in morbidity from various diseases in the US from the pre-vaccine era to the modern era. In 1988, the World Health Assembly decided to start tyring to eliminate polio from the world through comprehensive vaccination programs. Look at the progress so far. 7. Infant death rates from all kinds of causes have dropped. This charts shows changes in the US since 1960. 8. Children born now are much more likely to have access to clean drinking water. 9. And life is getting better in other ways too. Fewer people around the world now have to live on $US1 a day. Global income distribution has shifted so that many people who were making $US1 a day are now more likely to make $US10 a day. 10. As the numbers of extremely poor people in the world fall, more and more of the population is being pushed into higher income categories. This chart divides the world into those above the middle class, the middle class, the near poor, the moderately poor, and the extremely poor. Obviously, there’s still room for progress, but the percentage of workers that are middle class and above has grown. 11. The number of international conflicts, which tend to kill more people than civil wars, has been declining steadily. Harvard psychology professor Steven Pinker explains that violence of all sorts has been declining for years — by most measures, we’re living in the most peaceful time in human history. 12. Despite the fact that we hear a lot about gun murders, firearm homicides have dropped significantly since the 1990s in the US. 13. Youth violence has declined too. The CDC shows that youth homicides are less than 50% of what they were in the mid 1990s. 14. The decline in homicide rates isn’t just a modern day one either. Historical data shows that homicide rates in the modern era are drastically lower than they were centuries ago, and that number is still declining. 15. US data on the long term decline in the homicide rate shows a similar trend. Thought there have been some fluctuations, there’s a clear trend towards fewer homicides over time. 16. Rates of domestic violence have also fallen. 17. Anyone born today in the US is much more likely to grow up literate. 18. That’s true for kids born all over the world. 19. And we also live in a world now that takes “rights” into consideration much more than ever before. 20. People born now will most likely receive more years of education than they would have in the past. 22. People are much more likely to live in a democratic society. 23. More people have access to the internet than at any other time in history, and that percentage continues to grow. The world is far from perfect, and there are plenty of areas of improvement needed. But is now the best time in history to be born?